The 2014-15 Philadelphia 76ers basketball season will be the 76th total for the team and 66th in the NBA (National Basketball Association). The team has played in Philly for the past 51 years and will be looking to build on their dismal season from last year when Nerlens Noel was not able to see the court at all due to rehabilitating his knee that was injured while playing at the University of Kentucky. The printable 2014-15 Philadelphia 76ers basketball schedule will be released soon and we will include it here for you. 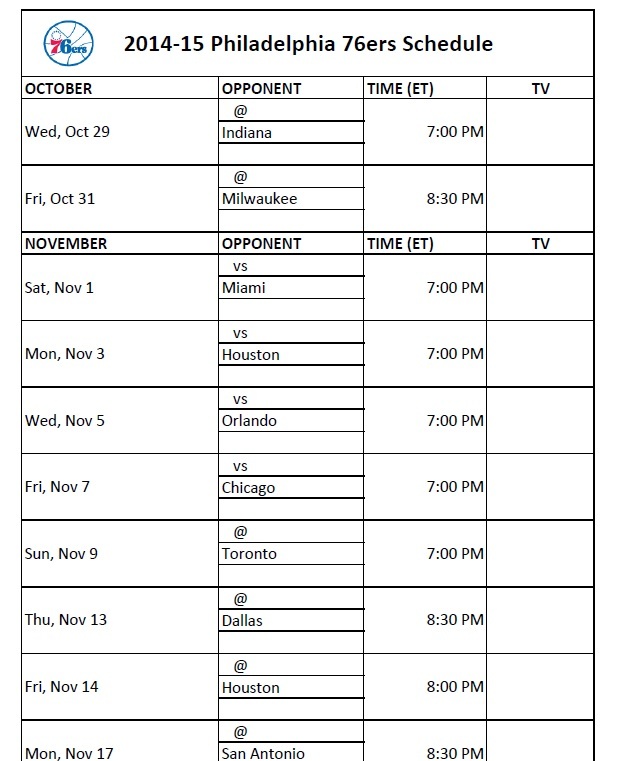 The following printable 2014-15 Philadelphia 76ers basketball schedule is provided for those who would like to print out the team’s schedule for the 2014-15 NBA regular season basketball schedule is released.